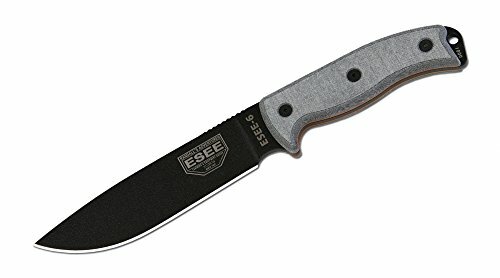 The 11.75" ESEE 6P Black Fixed Blade from ESEE - Our knives are made from high carbon 1095 steel. And while 1095 is a top choice for professional cutlery designed for hard use, it will rust and stain if not properly cared for - especially on the cutting edge and around the laser engraving. It is the user's responsibility to keep the blades properly lubricated and cleaned. We suggest using a dry film rust inhibitor such as TUF-GLIDE or TUF-CLOTH. If you have any questions about this product by ESEE, contact us by completing and submitting the form below. If you are looking for a specif part number, please include it with your message.